Les Dissonances, on its own label Dissonances Recordings, has refocused its attention on the music of Shostakovich. Following a recording of the Chamber Symphony in C minor, Op.110a (as arranged by Rudolf Barshai) the conductorless orchestra has released recordings of Shostakovich’s First Cello Concerto (with soloist Xavier Phillips) and his Fifth Symphony. Founded in 2004 in Paris by French violinist David Grimal, Les Dissonances recruits its players as a collective from international soloists and seasoned musicians from prominent orchestras, and also engages young talent. Originally a chamber orchestra it has grown in size, advancing from Mozart and Beethoven to twentieth century composers such as Bartók, Schoenberg and Schnittke. I notice that Les Dissonances is now in residence at Opéra de Dijon and give concerts at Cité de la Musique, Paris and Le Volcan, Le Havre. Shostakovich wrote two Cello Concertos for his Soviet compatriot soloist and former pupil Mstislav Rostropovich in the 1950s/60s, in the midst of the severe artistic constraints enforced by the authorities in Soviet Russia, which have helped shaped the enigmatic character of the scores. Both concertos contain outstanding episodes of technical virtuosity and profound emotional expression for the soloist. The symphonic writing too is considerable and challenging for the orchestra. Included here, the Cello Concerto No. 1 was written in 1959 a time when Shostakovich was at the height of his standing with the Soviet Authorities. Hearing Prokofiev’s Symphony-Concerto a work “which interested me greatly and also aroused my desire to try my hand at this genre” was the composer’s inspiration for the concerto. Shostakovich’s score bears a dedication to Rostropovich, who introduced the work in 1959 to great acclaim, with the Leningrad Philharmonic Orchestra under Yevgeny Mravinsky at Leningrad. Continuing the line back to Shostakovich, the soloist here Xavier Phillips had private lessons with Rostropovich. Upbeat and spirited, the opening movement (Allegretto) becomes increasingly troubled and tense with Phillips communicating a conspicuous searching quality. In the second movement (Moderato) the soloist brings a plaintive mood of deep introspection. After a more intense, rather earnest section the Parisian soloist develops a mood of almost unbearable sorrow with the orchestra creating a cold and unwelcoming landscape. Relishing the challenges of the writing Phillips excels in the anxiety laden Cadenza and one wonders if the composer is depicting a state of mental instability. Phillips provides an abundance of restless, nervous energy in the Finale: Allegretto with rhythmic writing punctuated with anguished cries. The conclusion to the work doesn’t quite generate the sense of extreme violence that I have heard in some recordings such as Gautier Capuçon and the Mariinsky Orchestra under Valery Gergiev on Erato. This is a fine performance by cellist Xavier Phillips, using his Matteo Gofriller cello (1710), and Les Dissonances, nevertheless, my first choice recording of both Shostakovich Cello Concertos is played with distinction by soloist Heinrich Schiff with the Symphonieorchester des Bayerischen Rundfunks conducted by the composer’s son Maxim Shostakovich. Impressively recorded for Philips at the Herkulessaal, Munich in 1984 there is formidably powerful expression and deep intensity in the emotional cross-currents of these absorbing accounts from Schiff that are compelling in every way. In 1934 the Soviet leader Josef Stalin attended a performance of Shostakovich’s Lady Macbeth of Mtsensk and was appalled by the opera’s content. Two days later the Soviet state newspaper Pravda ran a condemnatory editorial titled Muddle Instead of Music denouncing the opera as “coarse, primitive and vulgar.” Lady Macbeth of Mtsensk was banned and Shostakovich was placed in a disturbing state of dishonour. During the rehearsal stage of his austere and introspective Fourth Symphony a work lacking in the uplifting melodies insisted upon by Stalin he was advised to withdraw the score before its première. In an attempt to rehabilitate himself with the Soviet Authorities the Fifth Symphony is more openly conservative in style and its première in 1937 at Leningrad was a triumph. Evidently, on a suggestion by a journalist a couple of months after the première, Shostakovich subtitled his Fifth Symphony ‘A Soviet Artist’s Response to Just Criticism’. After Shostakovich’s new and frightening denunciation in 1948 it was Kurt Sanderling who conducted the first revival of the work. Right from the opening pages of the Moderato movement I soon became aware of the orchestra’s brilliant sound but compared to my ideal there are not enough sonorous low strings. Initially I wanted more sense of mystery and intensity but overall the emotional effect Les Dissonances achieves towards the end is compelling in its bleakness, anxiety and foreboding. Cloaked in nervous energy the brief Scherzo, often said to contain the spirit of Mahler, communicates through a sardonic waltz of a forced tongue-in-cheek quality. Despite what has gone before, shafts of light shine through the murk. Scored without brass, the agonising Largo projects emotional vulnerability, deep despair and intense introspection, which evoke a bleak landscape laid to waste. I love the way the brass and woodwind rouse from their slumbers in the raucous opening to the Allegro non troppo. With martial-like passages full of swagger, stirring vigour and drama the players develop a powerful forward momentum. It feels exhilarating as the music rushes impetuously to an awe-inspiring conclusion of outward triumph. 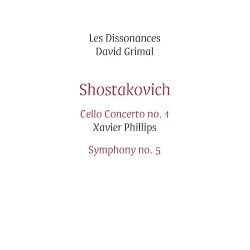 Les Dissonances play Shostakovich’s most popular symphony with intelligence and spirit providing an excellent performance that does its players credit. However, there are a number of superior accounts in the catalogue. Originally released on Melodiya I admire the compelling account from the USSR Ministry of Culture Symphony Orchestra under Gennady Rozhdestvensky from the 1980s reissued on Olympia. Another recommendation that keeps growing on me is that of the Berliner Sinfonie-Orchester under Kurt Sanderling from 1982 in Studio Christuskirche, Berlin on Berlin Classics. Sanderling gives a sterling performance which lingers long in the consciousness. For its significant insights, also recommendable is Rudolf Barshai with the WDR Sinfonieorchester Köln recorded in 1996 on Brilliant Classics. The label Dissonances Recordings lavishly presents this disc in the form of a hard-back book including programme notes on each work, information on Les Dissonances and an essay by Xavier Phillips on Rostropovich. Recorded at live performances at Opéra de Dijon the engineering team provide excellent clarity and pleasing balance. Les Dissonances, with Xavier Phillips in the concerto, perform Shostakovich with intelligence and spirit providing an excellent performance which does its players credit.